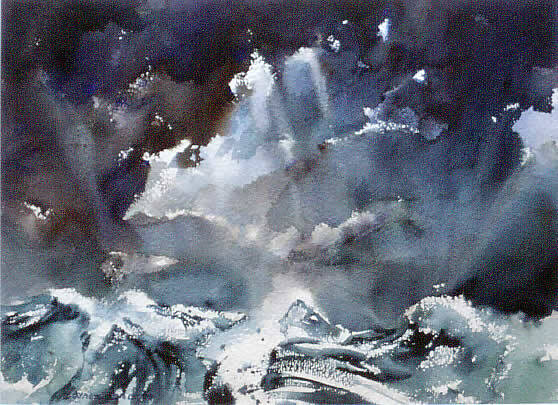 This seascape is another example of intuitive interactive realism: I work onto the wet sheet of paper and work with the emerging and suggestible glimpses of light, form and rhythm. In this way a more naturalistic balance of rhythms may be achieved because water itself is not only subject, but also the medium. My thinking at the outset is totally fluid and receptive to the changes occurring on the paper in real-time. It is not 'random' however: I sense an emerging rhythm then allow that developing awareness to guide my brush and the sequence of choices as to the placement or modulation of forms.